“Hold onto your mask when you jump in”, they said. “Swim hard and follow the guy in high-vis rashie – he knows what he’s doing! Above all, whales don’t fly! So keep your head down and in the water”. I was genuinely mesmerised by the presence of this ethereal beauty. A visitor in its habitat, immersed in the experience, I just let myself live the moment. Breathing was optional. I think there was still a snorkel tube in my mouth if I needed it. It just couldn’t get any better. At that point, a big shout out to the crew is deserved. Sensing the whales weren’t in the least bit phased, they swang the boat back in front of their trajectory for another swim. This time I saw the baby again, at eye level, and I swear she/he (I can’t bring myself to call it, it), rolled over, raised a fin and gave me a good long, inquisitive eye-balling. Wow. 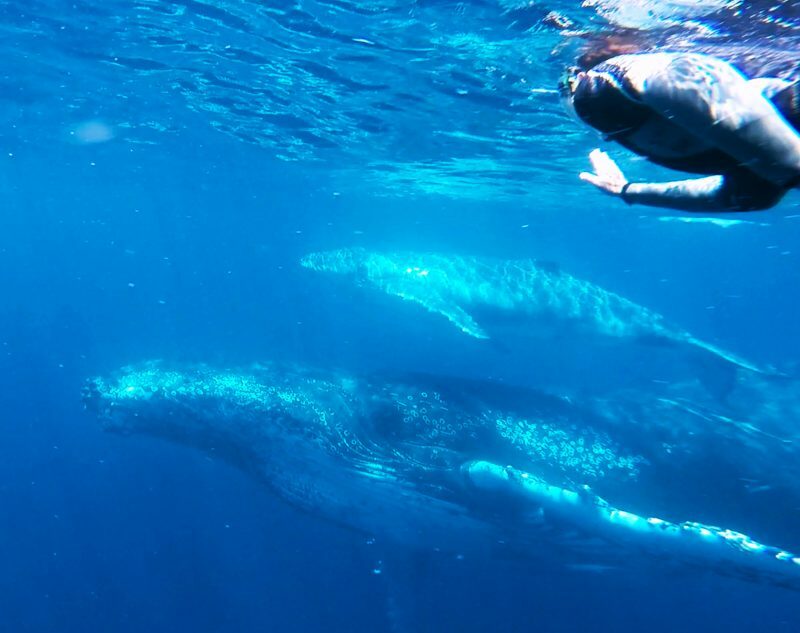 Sunreef Mooloolaba operates Swim with Whales – Australia’s first Swim with Humpback Whales experience. 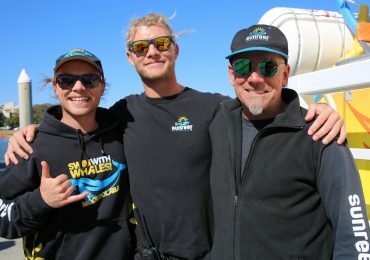 This 4-hour tour (from $149) involves the opportunity to enter the water with an experienced guide when whales are sighted and conditions are right. Mooloolaba is close to Noosa and easily accessible by car or Sunreef offers transfers subject to conditions. See www.sunreef.com.au for more information. Sunshine Beach Accommodation’s selection of holiday properties in Noosa and Sunshine Beach offer ideal locations to base yourself for a whale experience, whether it be watching whales from the Noosa National Park or taking a short trip to Mooloolaba to go whale-watching or to swim with whales. Contact the Office for more information and to book.